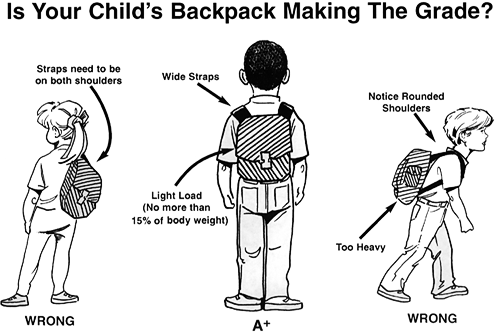 Always use both shoulder straps to keep the weight of the backpack better distributed across the child’s back. A cross body bag can also be a good alternative for carrying books and supplies. Encourage your child or teenager to tell you about numbness, tingling, or discomfort in the arms or legs, which may indicate poor backpack fit or too much weight being carried. Be sure the school allows students to stop at their lockers throughout the day to drop off or exchange heavier books.